I bought it for $10 and it was worth every penny. Love this thread. Been waiting for a price drop on Darius. Ms. Pacman Original Cocktail with Non destructive mod to Groovy Arcade Linux with All 4way Vertical Cocktail capable 2 button or less games. 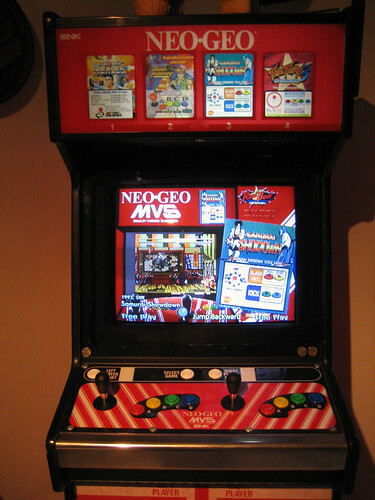 Neo Geo MVS Mame Cab Running Hyperspin, 25" Nanao Arcade Monitor, Mini-pac, ATI Radeon HD 4850 (ATOM-15), IL 8 Way Euro-Sticks from Paradise Arcade, Win XP 64bit, and tons of other junk. Thanks for Darius Burst. I'd been waiting for half a deal on it. Between that and finally breaking down and paying $20 for DOA Final Round, I feel like I've spent a fortune lately compared to what I usually pay for games. where'd ya find DOA5 for $20? It was a steam sale yesterday or the day before. Before I posted about it today I checked and it is no longer on sale. I got an email from steam about it being on sale because it was in my watch list. I didn't post it on here because it's still not cheap by most people's standard. That game hardly ever goes on sale though. The price of the DLC is just absurd. I don't plan on buying any of the extra costumes. It doesn't add any value to the game IMO. Mushihimesama also on sale for 40% off ($12) can use the code above too for it. I ended up asking steam for a refund of DOA over controls issues. The game is not compatible with fightpads or fight sticks. Triggers can't be mapped. Right thumbstick press is required to pause game and exit a fight. (The Start and Back buttons behave like normal punch and kick buttons. Could be that they are using dinput instead of xinput, but the on-screen controller is an xbox360 one). Someone posted an x-padder workaround but it requires you to wait until the game has loaded before plugging the controller in. I expect better for $20. Might revisit it when it hits $5. EDIT: Darius Burst is great! Not bad for a decent game esp. since it includes the Black Armor edition of the game, the artbook, a 12" warrior figure, cloth map, and sound track. PAC-MAN™ Championship Edition DX+ All You Can Eat Edition $4 on Humble Bundle. I can see this in a pedestal. I got it for the kids because it's a dollar waster at Dave & busters whenever I take them. It runs full screen also as opposed to the Royale game. Steam has BroForce on sale for $5.99 through May 9th. Hopefully that means it's cab friendly. I'm on the fence. I've bought a fair number of games recently that I haven't even installed yet. Strider is in the current Humble Bundle. expendabro's is the free version if you want to try it. The kids and I love playing bro-force together. Rayman Origins is part of the current Humble Bundle. Not sure if it's Arcade friendly, but I've invested in Xbox 360 gamepads for Steam compatible stuff so it should not be a problem. (Although, this version is DRM free). Been picking up a bunch of cheap games on the Steam Summer Sale. Saviors (Star Saviors) is pretty damn good for $0.49! GreenManGaming is having a big sale. Must be logged in to see discounted prices. The individual game pages aren't loading quite right for me. I already own all these games, so haven't tried to buy. EDIT: Must have been the latest borked internet explorer updates. Seems to work ok with firefox. Someday I'm going to have to sit down and actually play these games. I was eyeballing SFxTekken since I have it on my 360 that hasnt been turned on in like a year, but its got GFWL integration that isnt patched out and I cant be bothered to do the work around. For you fighter peeps out there, Humble Bundle has a bundle that includes Skullgirls with all the DLC for a bit over 7 bucks. Fuzzy Wuzzy was a woman! Steam Store has Gundemonium games for $2.39 each or $5.99 for all 3.
steam has shmups on sale!!!!! Thanks Malenko, I'm a few dollars poorer now, and that sale page is looking like a nearly winning 'In Library' Bingo card. Now's a good time to remind everyone to check https://steamdb.info/sales to get an idea of what's a deal and what isn't. SteamDB doesn't reflect bundle site sales, but you can see if a title frequently goes on sale, or is at it's biggest Steam discount. (This site also has cheap Windows 10 OEM licenses with a guarantee for about $30 or so). That right there should be telling you that you're not dealing with a legit site. Also, "We suggest using the automated phone system in order to activate your code." Because they know they're reusing codes, and the phone system will let it activate until it sees the code again from two active systems. By that time, your 30 days are up, and you're stuck. I thought the same, but I've activated it over the Internet with zero issues. I also pay the extra $1.30 for the Kinguin insurance guarantee it's a legitimate key in case it happens. I learned about it in this video (it was original only $20) but since this video was released it has increased to $30. Not likely reusing keys -- instead they are purchasing keys from MS as a refurbisher/Oem supplier - figure MS sells Off lease re-manufacturers and OEM sellers licenses for pennies on the dollar, since these systems have already purchased an original license for that system when Dell,HP,Lenovo, etc. sold the system under a leasing option to a large business, so making a few more dollars to resell the license on a previously activated machine is more than they would make if the re-manufacturer just kept using the original license. So while these $30 licenses are not completely "Legit" - once you use it on a system and it activates you will not run into problems later with it being flagged since it is only used on the one system not being reused as you mention. The video hits most of the points that people need to understand. I'll just add: As on Ebay, Pick your Kinguin seller carefully. ...they are purchasing keys from MS as a refurbisher/Oem supplier...So while these $30 licenses are not completely "Legit" - once you use it on a system and it activates you will not run into problems later with it being flagged since it is only used on the one system not being reused as you mention. Where this is the case, (consistent with the video and DeL's experience) the license will activate without needing to phone activate. Since Kinguin is recommending phone activation, they know fishy things are going on, and they'll consider the matter closed if the key activates by phone. Also, you can't know if your key will later be given to someone else. It's a matter of trust. You already know that reselling OEM keys obtained per your scenario would not be legit. If they're willing to do one, they could later decide that they're willing to do the other. Page created in 0.21 seconds with 61 queries.